After more than a month berthed to the International Space Station (ISS), SpaceX‘s CRS-9 Dragon capsule was detached and released from the orbiting complex. 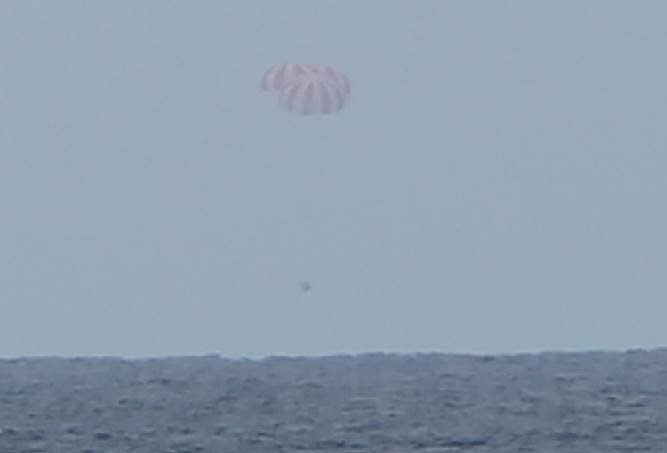 A few hours later, the spacecraft was deorbited and recovered in the Pacific Ocean off the coast of Baja California. After being packed with more than 3,100 pounds (1,400 kilograms) of return cargo, the capsule was unberthed from the Harmony module in the early morning hours of Friday, Aug. 26. 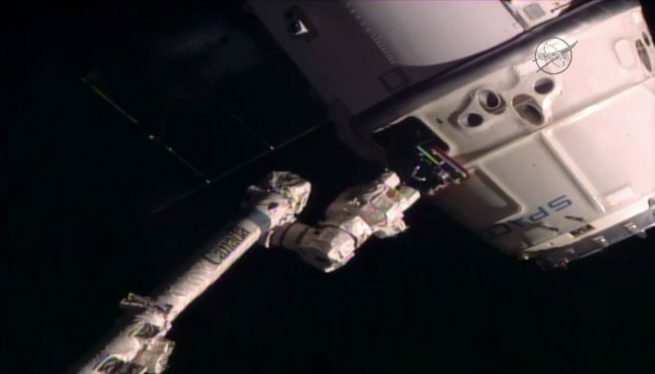 Ground teams commanded the robotic Canadarm2 to move Dragon to a release point some 33 feet (10 meters) below the Destiny laboratory. At 6:11 a.m. EDT (10:11 GMT), Expedition 48 astronauts Kate Rubins and Takuya Onishi commanded the arm to release the vehicle. “Houston, station, on Space-to-Ground Two, Dragon depart successfully commanded,” Rubins said as the vehicle began moving away from the outpost. As soon as the arm moved away safely, a number of commands were automatically executed by Dragon as the crew monitored its departure. The first was only minutes after release. The spacecraft’s Draco thrusters gently pushed the capsule down and away from the outpost. A second burn was conducted some 90 seconds later to push the capsule outside the station’s “Keep-Out Sphere” – an area of about 656 feet (200 meters) around the complex. After a 180-degree rotation and a third departure burn, Dragon left the vicinity of the ISS and placed itself on a trajectory to increase the distance between it and the outpost to around 93 miles (150 kilometers). Once it arrived at that distance, nearly five hours later at about 10:56 a.m. EDT (14:56 GMT), Dragon fired its Draco thrusters one last time – this time for about 10 minutes. This slowed the vehicle down by 328 feet (100 meters) per second in order for it to drop out of orbit. About six minutes after the burn, the capsule separated from the trunk. The later will burn up and is not recoverable while the former has a heat shield to protect it from the atmosphere. Some 30 minutes after the beginning of the deorbit burn, Dragon began entry interface. It hit the upper part of the atmosphere and began its fiery descent to Earth. The capsule is equipped with an in-house made PICA-X heat shield designed to withstand temperatures nearing 2,900 degrees Fahrenheit (1,600 degrees Celsius). 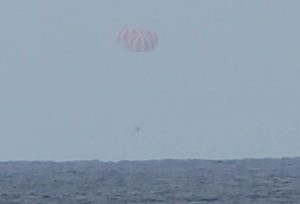 A few minutes after that, some 10 minutes before splashing down in the Pacific, drogue chutes were deployed, slowing the vehicle down and ensuring the right orientation for the deployment of the three main parachutes. Once those were opened, the capsule was slowed to around 10 to 12 miles (17 to 20 kilometers) per hour. Splashdown occurred at 11:47 EDT (15:47 GMT) some 325 miles (523 kilometers) west of Baja California where recovery ships were waiting. Within 48 hours of landing and recovery from the Ocean, the capsule will be transported back to the Port of Los Angeles where any critical time-sensitive cargo will be unloaded and transported back to a NASA facility. Among the samples being returned to terra firma are those from the Heart Cells study, which aims to understand how microgravity effects human heart cells, and samples from two rodent investigations: the Mouse Epigenetics and Rodent Research-3-Eli Lilly studies. Mouse Epigenetics is exploring altered gene expression and DNA by monitoring changes in the organs of male mice. Those mice were in orbit for more than a month – the duration of CRS-9. Rodent Research-3-Eli Lilly is looking at the rapid loss of bone and muscle mass in the legs and spine of mice. The goal is to compare it to what is experienced by people with muscle wasting diseases or limited mobility. An antibody that is known to prevent muscle wasting in mice on Earth was also tested. The CRS-9 Dragon was lifted off Earth more than five weeks ago atop a Falcon 9 rocket from Space Launch Complex 40 at Cape Canaveral Air Force Station in Florida. The July 18 launch took place at 12:45 a.m. EDT (04:45 GMT). Nine minutes later, the first stage of that rocket came back to the launch area to perform a propulsive landing at Landing Zone 1 (formerly Space Launch Complex 13). The capsule itself was placed into low-Earth orbit on a course to rendezvous with the ISS two days later. It brought more than 5,000 pounds (2,300 kilograms) of supplies and the International Docking Adapter-2 (IDA-2) to the outpost. Last week, IDA-2 was robotically removed from the trunk of Dragon and moved to the front of Pressurized Mating Adapter-2 (PMA-2) where it was manually connected by two spacewalking astronauts. PMA-2 is located at the forward port of Harmony. IDA-3 is expected to be brought to the outpost with the CRS-16 Dragon sometime in 2018. It will be attached to PMA-3. Both will be used to support commercial crew vehicles beginning in mid-2017. The next Dragon to launch to the outpost will be CRS-10. It is currently scheduled for launch sometime in mid-November.